TRADING COMMODITY FUTURES AND OPTIONS INVOLVES SUBSTANTIAL RISK OF LOSS AND IS NOT BE SUITABLE FOR ALL INVESTORS. YOU SHOULD CAREFULLY CONSIDER WHETHER TRADING IS SUITABLE FOR YOU IN LIGHT OF YOUR CIRCUMSTANCES, KNOWLEDGE AND FINANCIAL RESOURCES. The domestic ending stocks numbers for corn and soybeans and the April 10th USDA report were rather bullish vs. expectations, but the world numbers were really bearish. It was a shock to some, myself included, that the USDA only added 125 million bushels to the corn balance sheet and left soybeans unchanged after finding larger then expected March 1st stocks. In hind sight though, this might be a typical USDA move. Corn ending stocks came in at 757 million bushels. This was a 125 million bushel increase over last month. This is a huge month over month increase, but it fell well short of expectations after the March 1st stocks report came in a whopping 400 million bushels over expectations. It seems likely that the USDA is looking to ease the market into larger stocks. And, if that is the case 757 million bushels now becomes the line in the sand that the USDA will not go below. We have seen it in years past where the USDA sometime in early spring gives us an ending stocks number and then builds on it in the reports to follow. It seems like this may be the case again this year. Some of the revisions they made in the US balance sheet seem justified, some do not, and some non-changes seem to stick out like a sore thumb. For one, and increase in ethanol usage is questionable at best. A very strong case could have been made for the USDA to decrease corn usage for ethanol. For months now corn usage for ethanol has been running 2-4 million bushels a week below the previous USDA estimate. There was a sharp increase in corn used for ethanol last week, but it could be premature to think this will continue. It would seem that the USDA could have certainly waited on this one. One of the most interesting aspects of this report was what the USDA chose not to change. The USDA left the supply side of the balance sheet completely unchanged. Production stayed the same as did imports. I am not sure this is accurate. It would make sense that a good chunk of the 400 million bushels that came in on the stocks report was due to either better then expected production or more then expected imports, or both. 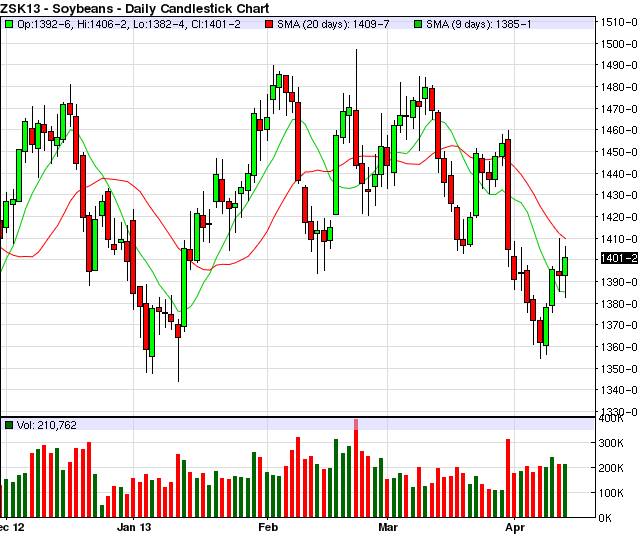 Leading up to the stocks report there were lots of rumors of old crop Argentina corn coming in through the gulf. I would think that in future reports the USDA will be increasing the supply side of the old crop corn balance sheet and therefore increasing ending stocks as well. 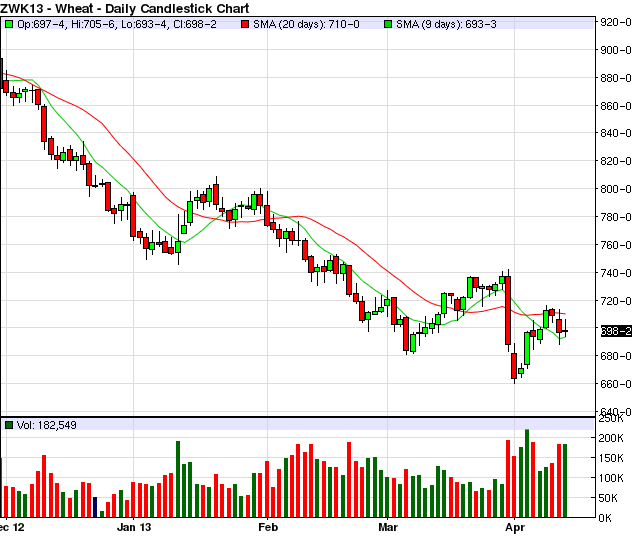 In the mean time there may be a window of opportunity here for corn, soybeans, and wheat. The less then bearish numbers form the USDA report along with cold wet weather could allow for a short term rally in grains. Delayed planting could mean lower yield potential, late harvest, and/or acres switched. After the weather issues last year the trade should be sensitive to any weather related issues. If a late planting rally does materialize, it might be a great opportunity to sell some better prices. Once corn planting is 50-70% complete we are probably going to look back and say that this cold wet weather was just what the doctor ordered. This year certainly seems much different then last year. 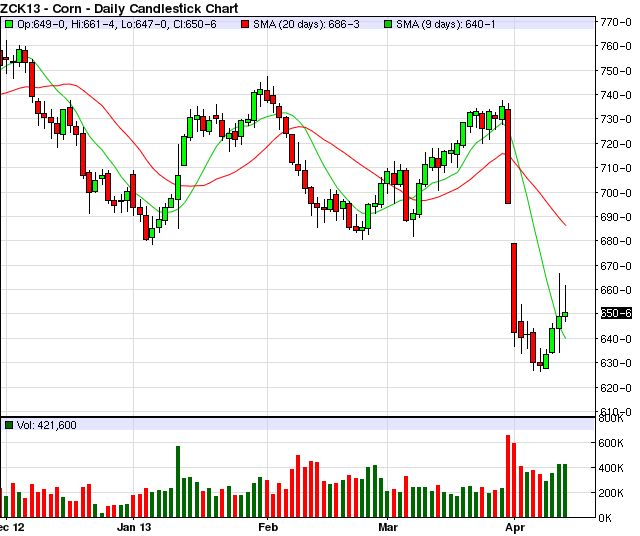 And, if we do have a decent growing season it is very likely that we will end up with massive corn ending stocks. In the mean time, soybean and wheat world ending stocks are already pretty massive. Producers should be thinking hard about hedging 2014 production. For now, it seems that 757 million bushels is the lowest ending stocks number we are going to see for old crop corn going forward. This certainly could now be the USDA's line in the sand that they will not go below. If anything it will probably be going up. All this means that speculators should be looking for opportunities and producers need to look to lock up some prices while we have corn near $7.00 and soybeans near $14.00. Give me a call for some ideas. In particular, producers looking to hedge all or a portion of their production may be rather interested in some of the options / options-futures strategies that I am currently using.